One of the most exciting things about visiting Georgia, other than the history, the people, the wine and the food…. are the mountains. Coming from a country (Australia) that does not have a true mountain I was full of anticipation for the day trip to the North Caucuses to visit the famous Gergeti Trinity Church and the waterfall at Gveteti, not far from Georgia’s northern border with Russia. The tour was arranged through info-tbilisi.com and my driver and guide for the day was Ashot, who was also the transport manager for the company. Together we set off in a large, comfortable black Landcruiser. Our route took us out of the Capital Tbilisi and past a large new shopping centre that demonstrated the progressive attitude of this former Soviet country. 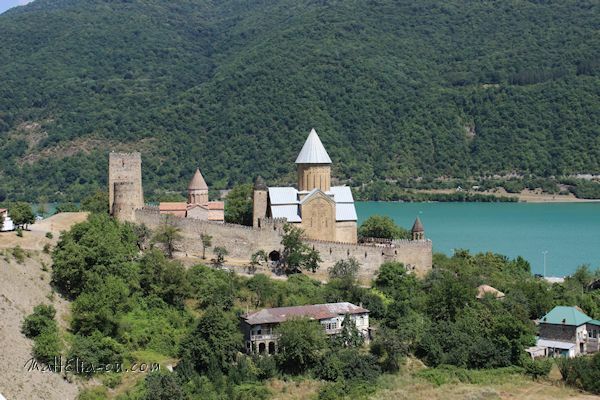 Further north we passed the 6th century Jvari Monastry perched high on a hill while across the river was the religious capital of Georgia, Mtskheta. These UNESCO listed locations were places for another tour. Soon we turned off onto the Georgian Military Highway, a name no doubt bestowed apon it by the Russians to signify its destination, and began to follow a river before we came to the spectacular Zhinvali Reservoir with its vibrant blue waters, dramatic hills and the 17th century Ananuri Fortress Complex that sits on a ridge overlooking the lake. Already the hills were gaining height and the small villages we passed through on the way provided glimpses into traditional Georgian life. Life seemed unhurried while the road, however, was busy with vehicles of all types. Old Mercedes were a common sight, not because people are rich in this country, but Germany dumps cheap used vehicles as rich Germans change vehicles at regular intervals. On my questioning Ashot about the number of Mercedes, he simply said they were reliable and tough and Georgians liked them. Given the state of many of the roads in Georgia (including the cities) tough cars are a must. I guess that is why there also plenty of rough and ready Russian era Pandas still on the roads. Trucks were also common, labouring their way along the winding road, some trying to make best time and others trying their best to keep going. We managed to weave our way through the slower traffic as we followed the river up the main valley, past smaller steep sided valleys that delivered water from small streams to the main flow. Climbing higher through many switchbacks and past a ski field that seemed to be asleep during its summer season, we arrived that the Russian Georgian Friendship Memorial. While this was a rather odd looking curved-wall structure adorned with modern frescos, it was the view of the valley and mountains that was truly impressive and drew me to the precipice. 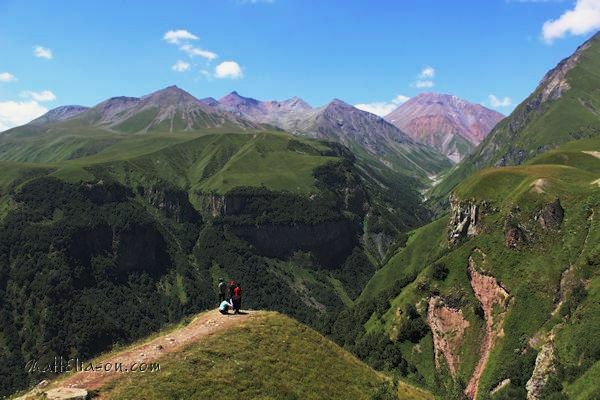 We finally reached the top of our climb at 2,300 metres at Jvari Pass before making our way down into another valley. The road on this side of the pass was undergoing significant repairs and almost as delaying, were the omnipresent cattle on the road. 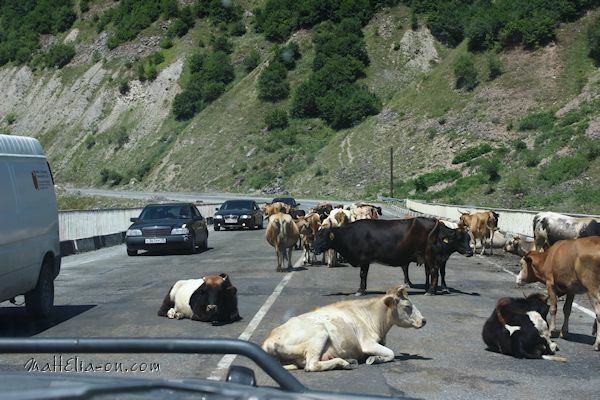 Despite having thousands of hectares of alpine pasture to wander, it seems cattle have a penchant for resting on the roads. Being a hot day it could not be the warmth of the road…the reason remains a mystery but they do not move for vehicles, including trucks and resolutely ignore the sounds of horns and revving motors. 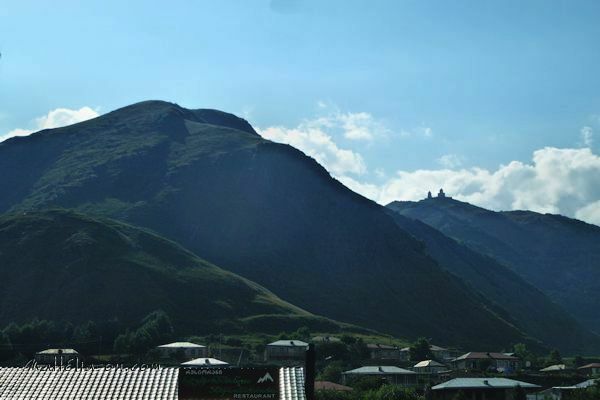 The mountain township of Stephantsminda is a hub of activity providing a jump off point for those wanting to visit the Gergeti Trinity Church. At over 1700 metres above sea level even during what was a heatwave in the region it was still pleasantly cool. 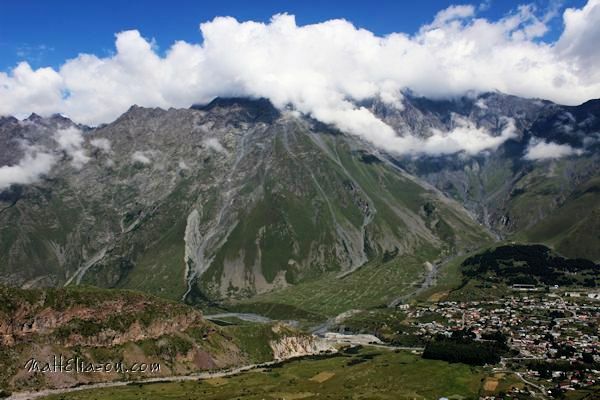 The town is dominated on all sides by incredibly steep mountains, including the 5040 metre Mount Kazbek. 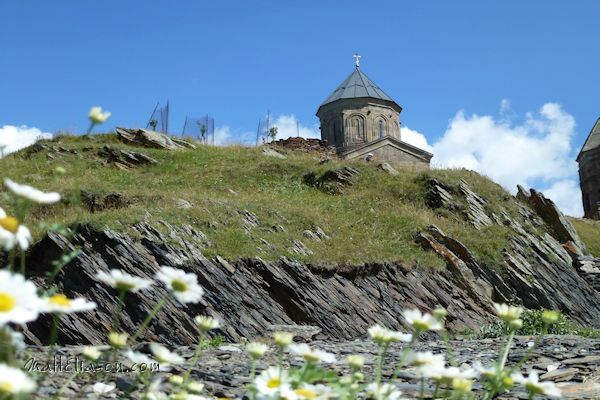 However the main reason for most people’s visit to the town is the start of a visit to the Gergeti Trinity Church. Some opt for a three hour each way walk and steep ascent, others hire horses for a led procession. For me it was to be the luxury of the Landcruiser as it negotiated the narrow unpaved laneways of the outer sections of the town. It is odd to think that high in the mountains, you would find a traffic jam but this is pretty much how it was as traffic shuffled back and forth to allow careful mirror tapping passing, an event that continued for much of the way up the rough 4WD track that led to the summit. We also passed weary looking walkers heading up and down the mountain, no doubt cursing the dust kicked up by passing vehicles! The 14th century Gergeti Trinity Church is one of the iconic images of Georgia, seemingly precariously perched high above the village below and with a spectacular mountain backdrop. Used as a repository for religious artifacts during the 18th century the church fills an active religious role and on this visit I was delighted to see a wedding ceremony taking place. What a place to get married! Despite it being mid-Summer and peak tourist season, while there were plenty of people around it was certainly not crowded as you may find in many other tourist locations around Europe, albeit a bit off the ‘easy-to-get to’ list. Our time at the summit was all too short and soon we were back in Stephantsminda enjoying lunch and a few shots of ChaCha (me, not Ashot), the local version of Vodka, before heading off just a few kilometres further west into the Dariali Gorge and turning off to the Gveleti waterfall. While many visiting this waterfall in standard vehicles have a 30-40 minute walk, our trusty Toyota and skilled driver took me to a point where it was only 10 minutes walking through the cool lush greenery before I arrived at the falls. 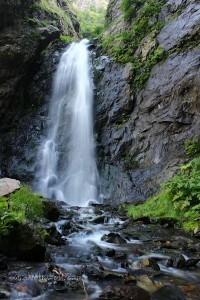 Georgia has some wonderful waterfalls but I don’t think this ranks in the top few. The view back down the valley was spectacular and as it was only a short drive from Stephantsminda and taking in the famous Dariali Gorge, one of only two passes through the Caucuses, it is worth the small effort to visit. The drive back allowed a whole new perspective as the view was reversed as we climbed back to Jvari Pass and down the long valley back towards Tbilisi as the sun sank lower in the sky. If anything the number of cows on the road was greater than on the trip up. If you are visiting Georgia, this trip is one of the must-do tours. Georgia is well-serviced by a number of international air carriers who fly from a range of European and Middle-Eastern cities.